A free mp3 download from Douglas Yeo with the kind permission of Clifford Bevan. The name and person of Clifford Bevan is well known to any serious student of the serpent. From a long and respectable career as a classical tuba player (Royal Liverpool Philharmonic) to his membership as keyboard player for the unique British band "The Temperence Seven" (which for a time was the opening act for the Beatles), Cliff was bitten by the serpent bug and became one of the leading serpent players in the world. He has literally written the book on the serpent and it related successors on the evolutionary road to the modern tuba in his "The Tuba Family", the second and most comprehensive edition of which was published by Piccolo Press in 2000. Shortly after I began playing serpent in 1994 I learned of Cliff and his serpent related exploits. I learned that not only is he a player and a scholar but he is also a composer and arranger of some significance. When I set about to make a recording of music featuring serpent (Le Monde du Serpent), I included Cliff's "Variation on the Pesky Sarpent" for serpent and piano (this work is, from all accounts, was the first work ever written for serpent and piano) and Berlioz Historical Brass commissioned him to write another work for the album, "Les mots de Berlioz" for choir with buccin, serpent, ophicleide and bassoon. I have met Cliff on only one occasion, in 1995, when he visited my summer home in the Berkshire Hills of Massachusetts where the Boston Symphony has its summer festival home, Tanglewood. Cliff was visiting our mutual friend, Craig Kridel, and the two of them were driving from South Carolina through the mid-Atlantic and New England states and one afternoon they found themselves in our backyard. The story of that afternoon is told in Roger Challoner Green's book, "In Pursuit of a Dream." The photo above/right shows Cliff with Roger (playing on a serpent for the first time), Craig and me. Cliff was for many years the fourth member of the original London Serpent Trio (photo at right). 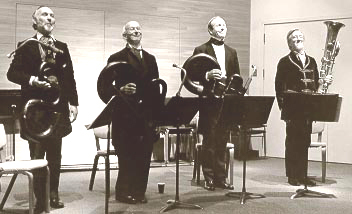 Such was the great sense of humor of the LST that when Christopher Monk, Alan Lumsden and Andrew Vanderbeek required a fourth player, whether on serpent or ophicleide, the group was still called a trio. With the death of Christopher Monk, Cliff became a member of the LST proper and he remains a member of that group along with Phil Humphries and Stephen Wick who make up the latest incarnation of the London Serpent Trio (photo below). Whether playing his ophicleide or his beloved python skin covered serpent, "Monty," Cliff always brings wit and charm to his playing in addition to his remarkable expertise. In 1989 there was a serpent celebration held in Columbia, South Carolina, which celebrated the 399th anniversary of the invention of the serpent in Auxerre, France. This was a monumental undertaking which included the premiere of Simon Proctor's "Serpent Concerto" by Alan Lumsden (which I have played myself many times and recorded on "Le Monde du Serpent") and a performance of "Under the Boardwalk" by a cadre of serpentists at a University of South Carolina football game halftime show accompanied by the USC marching band. But in many respects the 1989 celebration was a warmup for the 1990 celebration at St. John's Smith Square in London, an event that marked the 400th anniversary of the serpent's birth. 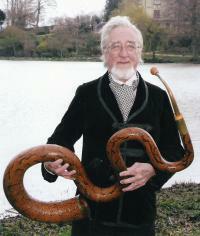 It was at the 1990 celebration that Christopher Monk's crowning creation, the contrabass serpent "George" had his public debut (commissioned by American serpentist Philip Palmer, "George" was the first properly constructed contrabass serpent since the 1840 "Anaconda" made by the Wood brothers of Huddersfield, England) and the 57 serpent players assembled were the largest gathering of serpent players in modern times. As a grand finale to the festivities, Clifford Bevan's arrangement of Tchaikovsky's "1812 Overture" was given on the celebration's final day, Friday, July 13, 1990. In 1990 I had never given any thought to the serpent; it was not until 1994, when the Boston Symphony was planning to play the newly discovered "Messe solennelle" of Hector Berlioz, that I saw the piece required a serpent and I set about to be the person to play that part. How I wish I could have been among the 57 who numbered the grand band of serpents on that day Bevan's "1812 Overture" was played in 1990. I have heard a tape and seen a video of that performance. Despite Cliff's best efforts as conductor, the challenge of bringing 57 serpent players of varying abilities together to play even an abridged version of the "1812 Overture" was a task that was only just possible. What the performance lacked in spit and polish and clarity of ensemble it certainly made up for in joyous, creative spirit, as Cliff encouraged the audience to, in the absence of cannon, pop balloons on cue. The sound was truly unlike anything I have ever heard before or since. Some time ago I began to give thought to how I might thank Cliff in a tangible way for all of his contributions to the world of the serpent. I thought first to organize another performance of Cliff's "1812 Overture" arrangement. But then reality knocked on the door. I am well aware of the challenges facing one serpentist who plays a solo etude. Duets multiply the problems by a factor of at least two and trios I have played have offered further challenges. I realized that not only could I not organize an ensemble of at least nine serpent players to play his arrangement, but even if I could, the result might not be all I might wish it could be. Two memorable "monster concerts" of serpent players was probably all the world needed. It would have been presumptuous for me to have attempted a third. But there was still another option. After some thought, I decided to embark on a performance of the Cliff Bevan's serpent ensemble arrangement of the "1812 Overture" having all of the serpent parts played by me, myself and I. An overdubbing project of epic proportions thus began. Cliff Bevan's arrangement of the "1812 Overture" was composed in the main for eight solo serpent parts. His abridgement of the piece is excellent, cutting nearly half of Tchaikovsky's original material while leaving all of the important thematic elements in place. Near the end, when the "big tune" ("God Save The Czar") enters, Cliff had the solo serpents joined by any number of "tutti" serpents. 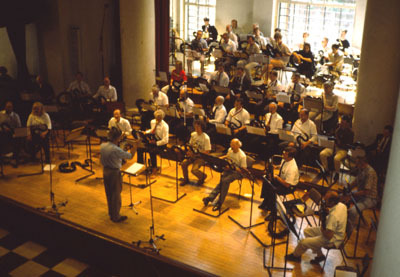 At the premiere performance in 1990, 57 players gathered on stage to perform the piece, most of whom played the "tutti" part. 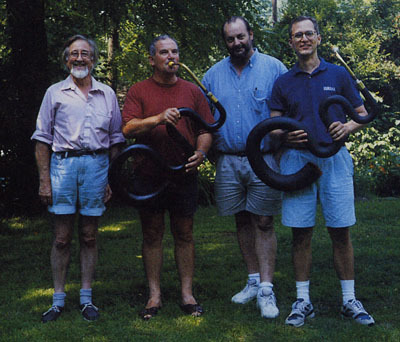 Two of those tutti players in 1990 played contrabass serpents, with Andrew Vanderbeek playing the original "Anaconda" and Phil Palmer playing his new contrabass serpent he had just commissioned from Christopher Monk, "George." Cliff's score indicates that balloons may be popped in lieu of cannon as was done at the original performance. The recording was done at Lily Bay Studio in Wayland, Massachusetts, which is run by my Boston Symphony Orchestra horn playing colleague, Richard (Gus) Sebring. On March 11, 2005, I brought my 1996 Christopher Monk Workshop serpent to the studio and put down the eight solo serpent tracks utilizing a click track as my conductor. Gus had made up the click track with the various tempo changes and that full day of recording also included my putting down several tutti tracks. On March 24, 2005, I returned to the studio to re-record some passages that needed to be improved, put down more tutti tracks and also added several tracks of tutti serpent with me playing "George." 8 SOLO SERPENT PLAYERS (serpents A - H). They are arranged in two groups, with A - D assigned to the left side and E - H assigned to the right side, as per the instructions in the score. 10 TUTTI CONTRABASS SERPENTS, "George." These are all organized from left to right in a fully spacial way, with "George" 1, 2, 3, 4 being the upper octave, 5, 6, 7, 8 being the lower octave, 9 being the last note only down an octave, and 10 being the last two notes, down an octave. 8 CANNON utilizing three different batteries of cannon. In sum, there are a total of 26 different serpent tracks. The number is significant. The original performance in 1990 utilized 57 players; I have recorded fewer than half that number. It occurred to me to record 58 tracks of serpentists, therefore making my recording the largest gathering of serpents on record. But that would be presumptuous and it would not be right for me to have done so. Rather, by recording nearly half that number of serpent tracks, I leave my contribution to the piece as simply my own, and not one that is in a contest with the past serpent gatherings of 1989 and 1990. The two instruments I used were my 1996 Christopher Monk Workshop serpent (walnut, one key, by Keith Rogers and Nick Perry) with metal mouthpiece by Hiro Imaoka of Yamaha, after a resin mouthpiece by Christopher Monk, and the 1990 contrabass serpent "George" by Christopher Monk with boxwood mouthpiece by Keith Rogers after the original metal mouthpiece for the the "Anaconda." I was so pleased that Cliff was very happy to receive my gift of this performance. I sent it to him with the intention that he enjoy it and to hear he was pleased was a wonderful reward for my effort. However, Cliff and I had some subsequent conversations about my little project and we discussed how it might be shared with others. I suggested to Cliff that I could release it on a CD and sell it to people, taking no profit for myself but paying him royalties on the sales. But Cliff thought it would be more fun to simply give it away and let people enjoy it at no cost. This is a remarkable gesture on Cliff's part but in this you see some of the measure of the man. After some discussion with the owner of my website server, I am very pleased to offer my performance of Cliff's arrangement of the "1812 Overture" as a free mp3 download. Cliff's reward is that people around the world have the opportunity to enjoy his arrangement. Before you click on the link below and listen to this yourself, I would like to add one more thing. While Cliff is very generous in allowing people to hear and download this performance of his arrangement free of his receiving any royalties, there is something you can do that would allow you to thank both Cliff and me for this free file. I'd like to point you to the Piccolo Press website, the site for Cliff's publisher. If you play in a serpent, trombone, euphonium, tuba or bassoon ensemble, why not consider purchasing a copy of Cliff's arrangement of the "1812 Overture" for your group? You can find his arrangement of the "1812 Overture" in the music for brass area of the Piccolo Press website. His catalog has many pieces for solo and ensemble that you might find useful. And, most important of all, if your library does not contain a copy of The Tuba Family, Cliff's definitive opus about the tuba and all of the instruments that came before it in its development, you simply must have a copy. Whether or not you play the tuba this book will give you endless enjoyment as you read a book written with scholarly insight in a readable, enjoyable prose that has more than a little English humor (or humour, as they say across the pond). The Piccolo Press website makes ordering quite easy, with order forms for orders in both US dollars and Great Britain Pounds Sterling. There is no greater gift for an author or composer than to know people are interested in his work. Do yourself a favor and offer your own thanks to Cliff Bevan by purchasing one or more of his arrangements and his book through the Piccolo Press website. The cost to you will be relatively small, but Cliff's reward will be great knowing so many people are interested in his work. With all of this, I conclude with saying, once again, thank you to Cliff. It is my hope that in sharing this performance of his arrangement of the "1812 Overture" that listeners will gain a greater appreciation for the capabilities of the serpent and appreciate, as well, one of the instrument's greatest exponents, Clifford Bevan. 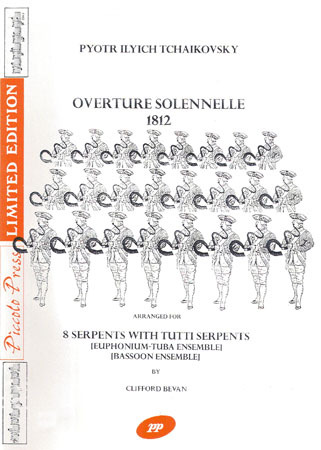 Click on the mp3 icon below to hear or download the mp3 file of Clifford Bevan's arrangement of the "1812 Overture" of Tchaikovsky, as performed by me on 26 serpents. IMPORTANT NOTICE: The music recorded in this mp3 file is � 1990, Clifford Bevan. All rights reserved. The audio file itself and the musical performance is (P) 2005, Douglas Yeo. All rights reserved. Clifford Bevan has graciously allowed this file to be made available Free of charge so interested people can hear his arrangement played by Douglas Yeo on 26 serpents. Even though this file is being offered for free, it is still under copyright and the user's listening to and/or downloading of this file carries with it the understanding that the user agrees to the following conditions: Permission is granted to individuals to listen to and download to private disk this file FOR PERSONAL USE ONLY. Permission is NOT granted for any commercial use of this mp3 file, nor may this file be put on any other website, sold, distributed, modified, "shared", or "traded." The file may not be appropriated for use in presentations or classes, nor may it be broadcast on commercial or non-commercial radio, television or any other broadcast medium without express written permission of Douglas Yeo. Violation of this notice is a criminal act and will be vigorously prosecuted under the laws of the United States of America and the United Kingdom of Great Britain and Northern Ireland. Your cooperation with this notice will ensure this file remains available for free for the enjoyment of listeners. Peter Tchaikovsky, arr. Clifford Bevan: 1812 Overture. Douglas Yeo playing 26 serpents. Approximately 7 minutes (8.2 MB). Please note that the speed at which you can download this file will be dependent on the kind of connection you have to the Internet and the speed of that connection. In order to listen to this file, you must have software installed on your computer which will allow you to play mp3 files. There are many mp3 players available on the Internet for free or at nominal cost. For Macintosh, some common players are iTunes, QuickTime, GreyAmp, MacAst and Audion. Some of these players are available for free from the ZDNet MacDownload.com website; Quicktime may be downloaded for free from the Apple Computer Website. For PCs, WinAmp and Microsoft Media Player are common players (I am a Mac user, so I cannot speak first hand about PC software). For Macintosh: Click on the mp3 file link and HOLD the mouse button - you will then get a "pop up menu" and you can choose "Download linked file" (Safari), "Save this link as" (Netscape) or "Download link to disk" (Internet Explorer). The file will automatically download to your disk. If you have a mouse with two buttons, click the right button and you will find the option referenced above. For PC: Right-click on the mp3 file link choose and choose save to disk. The file will automatically download to your disk. Photos of Cliff Bevan and the new London Serpent Trio (left to right: Cliff Bevan, Phil Humphries, Stephen Wick), courtesy the London Serpent Trio. 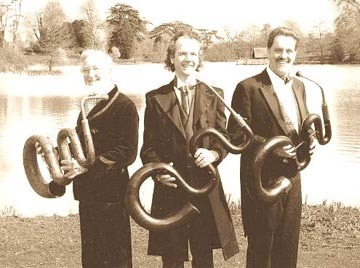 Photo of the original London Serpent trio (left to right: Alan Lumsden, Christopher Monk, Andrew Vanderbeek, Clifford Bevan [ophicleide]), courtesy Craig Kridel. 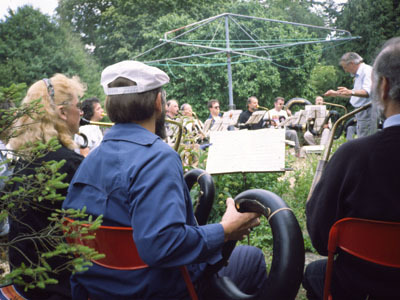 Photos of Cliff Bevan conducting rehearsals of his "1812 Overture" in 1990 (at St. John's Smith Square [the 1990 serpent celebration] and at Stock Farm House [the home of Christopher Monk and the first location of Christopher Monk Instruments]), courtesy Paul Schmidt (who operates www.serpentwebsite.com).